Dizzy from vertigo? Missing too much work? Missing out on your life? Benign Paroxysmal Positional Vertigo (BPPV) is caused by microscopic pieces of calcium bouncing around in your inner ears. Vertigo can be treated with drugs that dull the sensations, but drugs don’t fix the problem. The preferred treatment for vertigo is a set of movements (the “Epley Maneuver”) you can perform to guide those little calcium particles back into place. Many people find that the Epley Maneuver stops the vertigo attack or at least lessens the intensity. Doctors and physical therapists teach their patients the Epley Maneuver so that they can treat themselves whenever vertigo strikes. 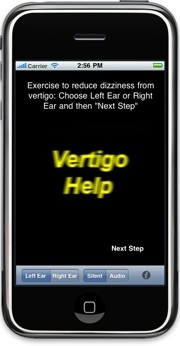 The Vertigo Help app takes you through each step of the Epley Maneuver. And if you’re too dizzy to focus on the words, you can turn on the audio and the app will talk you through each step. Note: you should only use this app if a medical professional has told you to use the Epley Maneuver.